NOVEMBER 12-14, 2015 - Space is limited!! Side x Side adventure a Sand Hollow is a family friendly event with guided trail rides, primarily rock crawling with some less technical scenic rides in and around Sand Hollow State Park in Hurricane, Utah. Dates are November 12th, 13th and 14th, 2015. Come down to southern Utah and test drive the latest offerings from the top manufacturers, take guided trail rides around sand hollow, get fed and meet new people. There is plenty of dry-camping available on site. Average temp for November is Sunny and 65 degrees, perfect riding weather. Visit http://www.sxsadventurerally.com/ for registration, info and trail information. All top major brands will be there for free demos! There are many places to rent SxSs in the local area. BUT, we are actually currently finalizing up a deal with a dealer in the area for special rates for those needing to rent for the SxS Adventure Rally. We hope to have that done by next week. If you can wait a bit, I'd love to get you that information as soon as we have it! Thanks for the question and we hope to see you there!! It's going to be an awesome Rally! To everyone joining us for the SxS Adventure (and thank you Charlie for asking). We have finalized a deal with http://www.rentutahtoyz.com/for anyone needing to rent a rig for the Rally. They will give a discount and beat any special deal someone might find. 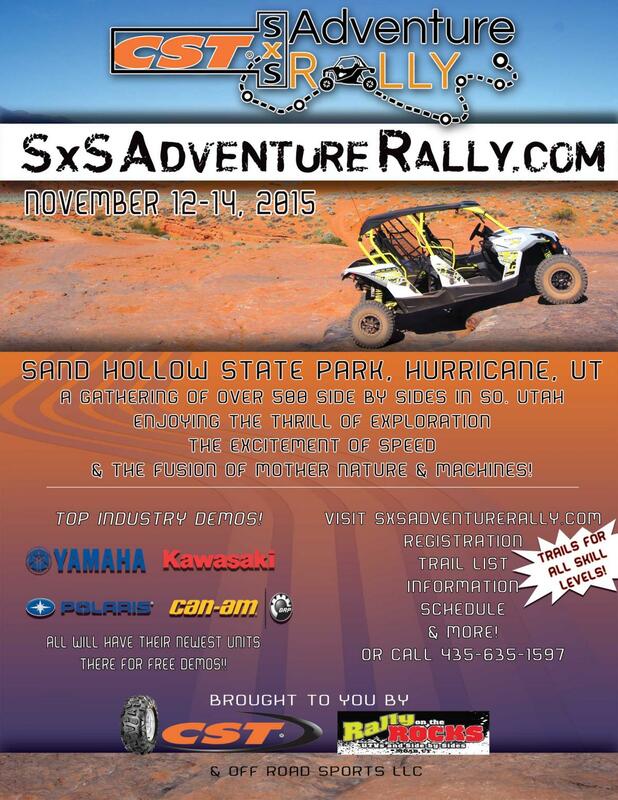 Just mention SxS Adventure Rally.